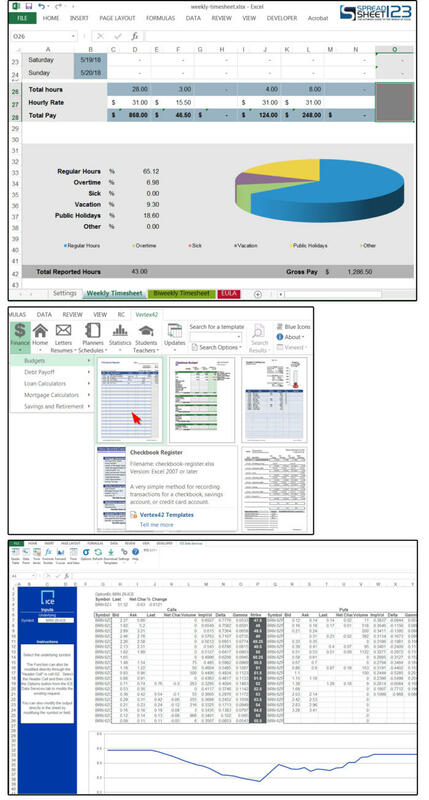 Excel add-ins are similar to smartphone apps and graphic plug-ins. That is, they are separate applications written by independent programmers who provide enhanced capabilities for the primary software. You can also get add-ins for Word, PowerPoint, and other popular programs. Most add-ins are either free or have minimal costs and generally consume very little memory. Many of them are down and forward compatible, but check the system requirements before downloading anything. Keep in mind that newer ones are not always better: many of the add-ins that were created years ago are still some of the best available. 1. To check which add-ins you already have on your system, go to File> Options> Add-Ins . 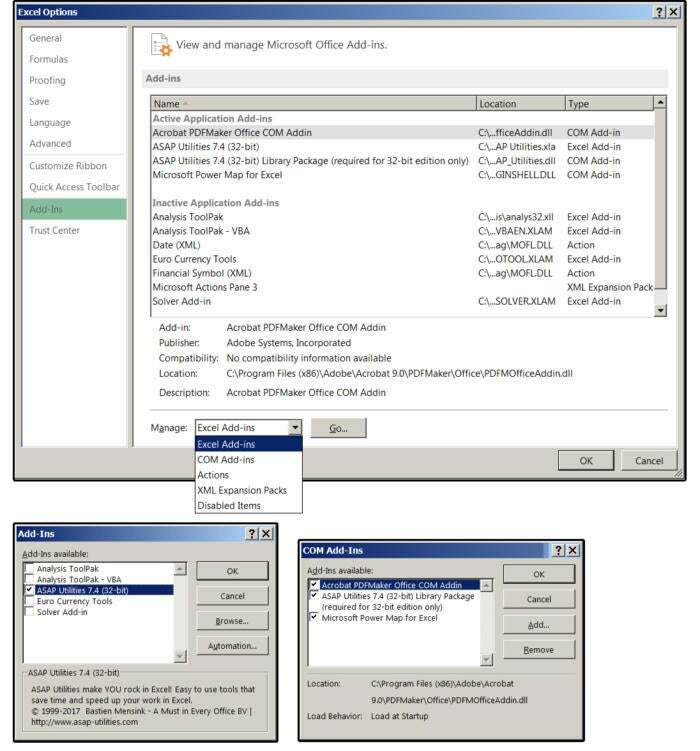 When the View and Manage Microsoft Office Add-ins screen is displayed, note that the active add-ins are displayed in Excel at the top and the inactive add-ins at the bottom.
. 2 In general, the active add-ins are displayed somewhere in the Ribbon. If not (or if your add-in does not appear in the list of active add-ins), enable the Office Add-Ins screen again. Select an option from the Manage: Dropdown (in this case, Excel add-ins), and then click Go .
. 3 Under add-ins available in the add-ins dialog box, select the check boxes next to any desired add-ins and then click OK .
. 4 If your add-in is a COM file, select COM Add-Ins from the Manage: Dropdown list, and then click Go again.
. 5 Under add-ins available in the [COMAdd-Ins dialog box select the check boxes next to any COM add-ins that you want to use, and then click OK . Note: The Add-Ins option at the bottom of the Backstage menu displays only the add-ins that come with Excel (for example, the Adobe Acrobat PDF Add-in ). However, you can customize the backstage menu with another add-in called Add-in Express or Visual Basic. There are two ways to find and install Excel add-ins. The first option is to search for Excel add-ins online, search and review hundreds of applications, access the Web site with the add-ins you want, and download and install the application directly from this Web site. 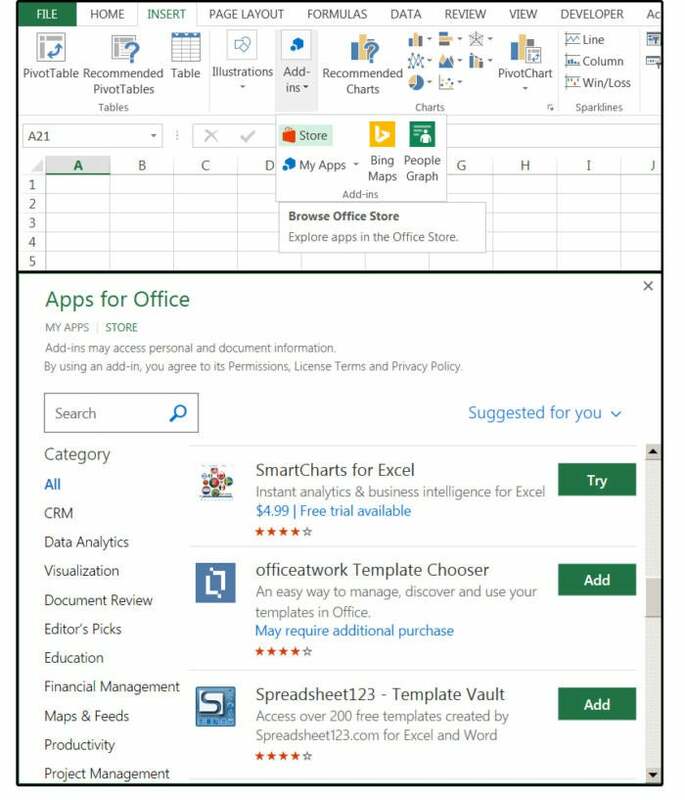 The second option is to search for and install the add-ins directly from Excel.
. 1 Add Insert > Add-Ins > Store .
. 2 In the Apps section for Office, select a single category, or click All ; or enter an add-in type in the search box.
. 3 When you have found the add-in you want, click the Add button.
. 4 Excel opens the selected add-in that you selected in the task pane on the right. Add add-ins from the Microsoft Store. Note: Some add-ins require you to sign up or register because some features are available on the developer's website. Others (such as SmartCharts for Excel) open directly in the task pane and can now be used. Also note that the application is not free if the Add button displays Try (instead of Add). Most paid-for add-ins require low fees, but some of them are actually very expensive. Check this before downloading the app.
. 5 Note that the SmartCharts add-in starts with a menu that is active and ready for use. Click the SmartCharts Sample / Demo button to see some of the impressive features of these add-ins. or click the Start with My Data button and start creating your custom graphs immediately. Take the stars / ratings that appear in the Microsoft App Store with a grain of salt. We tested most of the add-ins mentioned in this article, and many of those who received low ratings are actually quite helpful. Also, I have Excel 2013 and Excel 2016, and everything we've tested here works in both versions (probably because they're so similar), regardless of the versions listed (some add-ins need to be updated). 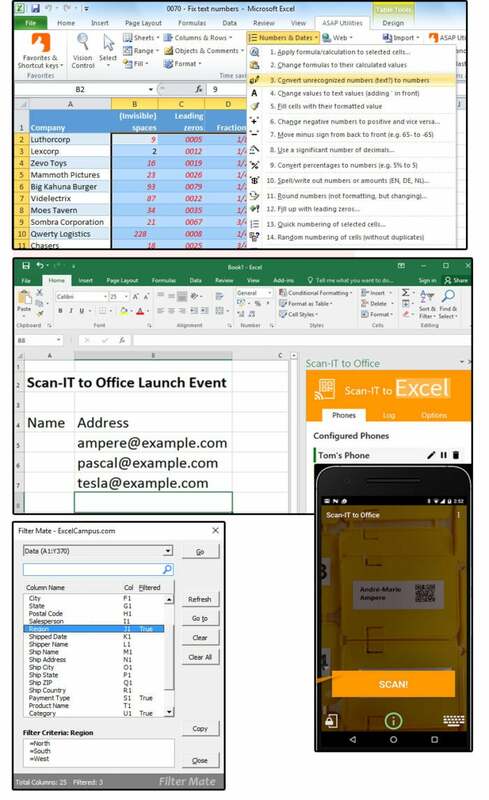 Now that you know how to find and install Excel add-ins, here are some of our favorites below. Note that some are new and some are for a while. We made our choices based on the personal needs, features and efficiency of the add-ins, the learning curve and the costs. Timekeeping add-ins are very popular because they track your activity and then generate a variety of reports to illustrate how you (and your employees) spend your time. For companies that charge the time of their employees, such as: As law firms, computer support companies and the like, time management add-ins save you and your colleagues time. This add-in works like a stopwatch so you can record and record all activities and / or projects all day long. 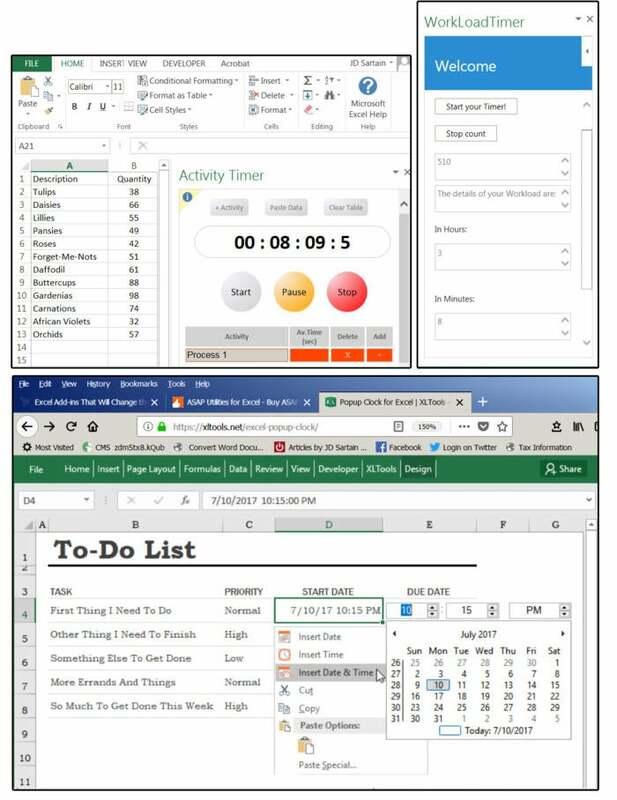 It is included in the task pane (right side) in your spreadsheet and is easy to use. Activity Timer costs $ 1.49 per month Remove Non-Product Link . It's not much, but all these monthly fees add up. I would prefer to pay a one time fee and own it. This add-in time tracker is part of the XLTools suite, accessed directly from the Ribbon menu on a separate tab. It appears next to the active cell with a "To Do List" that asks you for the time / task information. Use the pop-up clock to fill an entire range of time values. You can insert time data into tables, columns, rows, connected cells, non-contiguous cells, or a custom range, and the settings can all be customized. The one-time cost is $ 14.95 Remove Non-Product Link . Utility add-ins include a number of processes such as screenshots and renaming Current Files Find and remove external links, set default paths for the current file, close multiple files at once, remove all macros (VBA code) from the current file, barcode scanners, and more. This add-in is a true treasure. It has so many features, it could almost be a stand-alone program. It numbers automatically, faster, and offers more options than Excel's built-in fill tool. You can color-code some of the formulas so they can fix and subtract a single column in seconds into a table based on the cell color TOTAL and COUNTER, fix simple minus characters, select strikethrough formatted cells, and filter dozens of other functions to make tasks faster and easier do. A single-user license costs $ 49.00 Remove Non-Product Link but the many features are worth the cost. Everyone needs a barcode scanner at some point, and this one is pretty versatile. It works with Android, iPhone, iPad and MS Office programs 2013, 2016, 365 (online and desktop versions) for Microsoft Windows and Mac. It supports linear barcodes (EANs, GS1 DataBar (RSS-14), RSS Expanded and UPCs) as well as 2D codes (QR Code, Data Matrix, PDF417 and Aztec Code). Provides an adjustable barcode prefix and postfix, adjustable character sets for encoding, batch-scan mode and more. And you can scan data into multiple documents with one device, or you can use multiple devices at the same time to scan data into a single document. The fees are based on subscriptions: $ 4.49 per month or $ 29.99 per year Remove the nonproduct link . Another time-saving add-in that speeds up the long, slow, and tedious search process, and defines and filters data in columns, ranges, and tables. Use a function called Filter Hop to jump between filtered columns with one click, stop time-consuming horizontal scrolling across the table, and provide built-in filter menus for easy changes. It offers minimal features for a paid add-in ($ 22.22) Remove Non-Product Link but still pretty handy. This free add-in claims "instant analysis charts" for Excel, single-click views and data recognition. In addition to the standard line, bar, pie, and bubble charts, SmartCharts (SC) offers a variety of trend and multiple charts, all without modeling. Just point to any Excel spreadsheet and click on it to see which SC best represents your data. In case of doubt, SC makes suggestions. The cost is $ 1.49 to $ 4.49 per month. Remove the non-product link for subscription-based or 24,49 Euro plus tax (30,12 Euro) for single user license. Under this link you will find more pricing options. This add-in is only one of six items in AdaptPoint's "Maps" collection. It's interactive with multiple views, placemarks, and searches by city, state, state, zip code, or country. Along with its other companions in this collection, you have a product with many more features than the standard Google Maps, and it works within Excel and Word, eliminating everything that jumps between programs. Cost: $ 7.99 per add-in Remove the non-product link (site licenses are also available). This add-in boasts that it creates "data stories," not just diagrams, that is, they create 360-degree data visualizations, meaning that their diagrams explain records from all angles. According to Mzamose, modern diagrams are "more than just a diagram", they are a complete presentation of your datasets. Cost: Subscriptions Based on $ 1.49 per Month Remove the nonproduct link . This add-in has more than 200 templates and they are all free Remove Non-Product Link . They definitely compete with the paid products, corporate templates, budgets, planners, invoices, etc., but not so many options within each category. Click on the link above and scroll down to the category list to see the templates by topic. This add-in is more task-specific and focuses on complex real-time market analysis tables, which are quite unique. 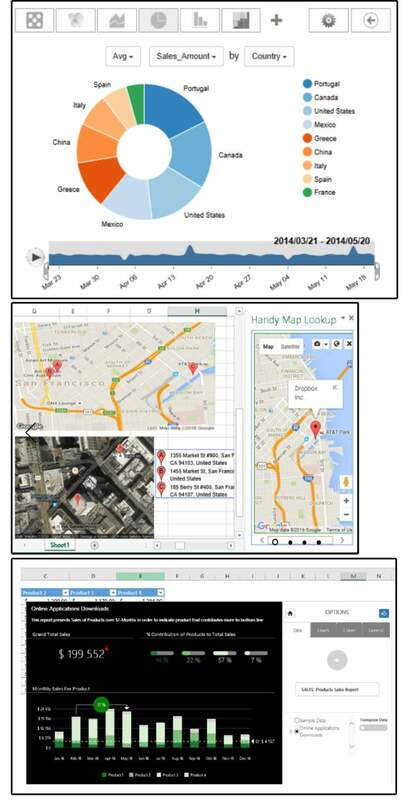 The templates integrate with your current Excel environment and provide live access to historical market data through the connection with the ICE data services. Many of the templates are free. Fees are Subscription-Based Remove Non-Product Link and vary drastically depending on how many ICE services you need.